This superb bouquet includes a selection of Nightingale, Pink Rhodos, and Belle roses along with gypsophila to bring it all together. 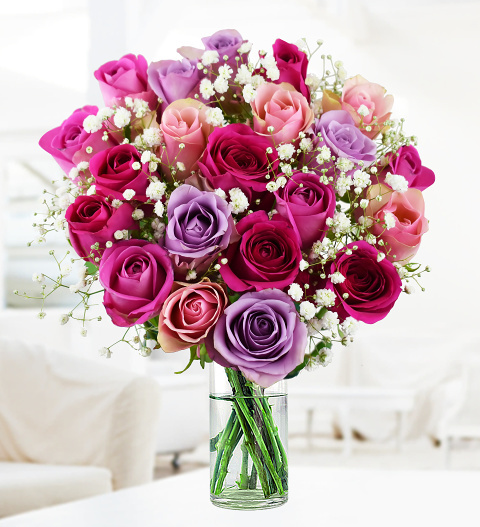 The roses used in this bouquet are sourced directly from farms in Nairobi, Kenya. The blooms grown by these farms in the Insinya region support the local villages by providing food, education, and healthcare to all the Kenyan families who work on the farms. Not only do these farmers have superior flower growing knowledge, but they also share our passion at Prestige Flowers for delivering the very finest roses. This luxurious rose bouquet is an excellent gift for birthdays, anniversaries, housewarming gifts, congratulations, and all other occasions. Chocolates may contain nuts.